If you don't have a password yet, you have to first sign up for a free evaluation license in order to download these input files. 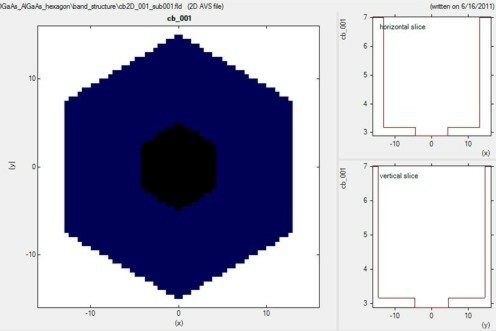 In this tutorial we solve the two-dimensional Schrödinger equation of a circular and a hexagonal GaAs/Al0.33Ga0.67As core-shell structure. 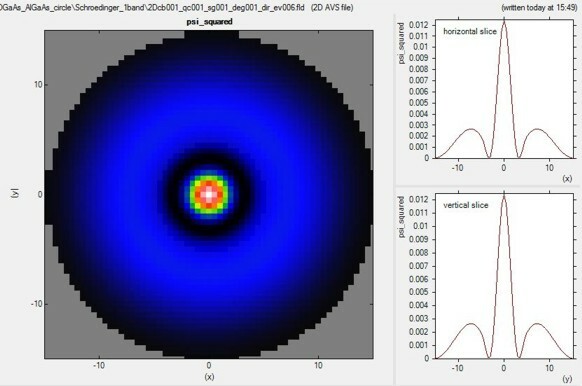 The following figure shows the probability density of the 6th eigenstate of the circular GaAs/AlGaAs structure. Its energy level is higher than the AlGaAs barrier energy, i.e. this state is not confined in the circular shaped GaAs quantum well. 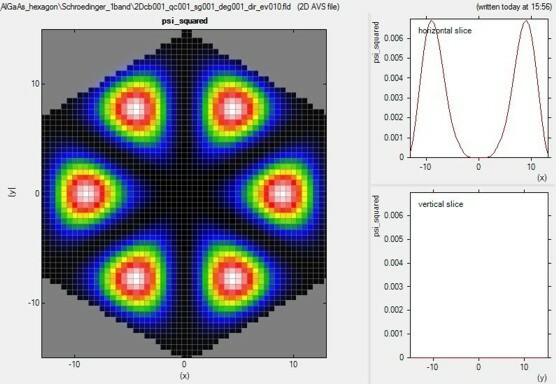 The horizontal and vertical slices are through the center and show the square of the probability amplitude of this eigenstate. The AlGaAs shell has a radius of 15 nm. It is surrounded by an infinite barrrier which is defined by the circular quantum region of radius 15 nm (nextnano3 input file). The following figure shows the conduction band edge of the hexagonal GaAs/AlGaAs structure. The GaAs region is indicated in black, the AlGaAs region in blue. Horizontal and vertical slices through the center show the energy of the conduction band edge profile. The diameter of the hexagonal shaped GaAs core is ~8.66 nm (corresponding to an outer radius of the core of 5 nm). The diameter of the hexagonal shaped AlGaAs shell is ~26 nm (corresponding to an outer radius of the shell of 15 nm). The following figure shows the probability density of the 10th eigenstate of the circular GaAs/AlGaAs structure. Its energy level is higher than the AlGaAs barrier energy, i.e. this state is not confined in the hexagonal shaped GaAs quantum well. The hexagonal GaAs core has an outer radius of 5 nm. It cannot be seen on this plot. The AlGaAs shell has a diameter of 26 nm. 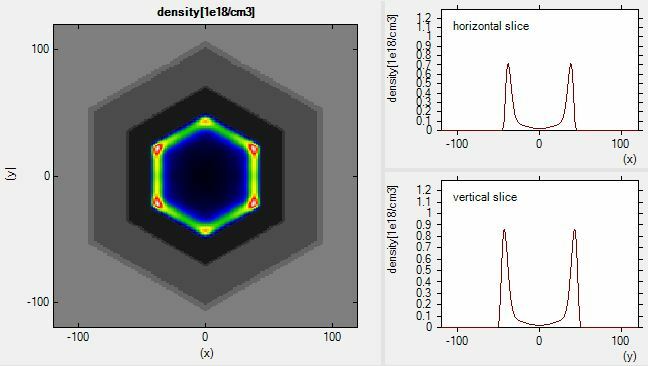 It is surrounded by an infinite barrrier which is defined by the hexagonal shaped quantum region of diameter 26 nm (nextnano3 input file). 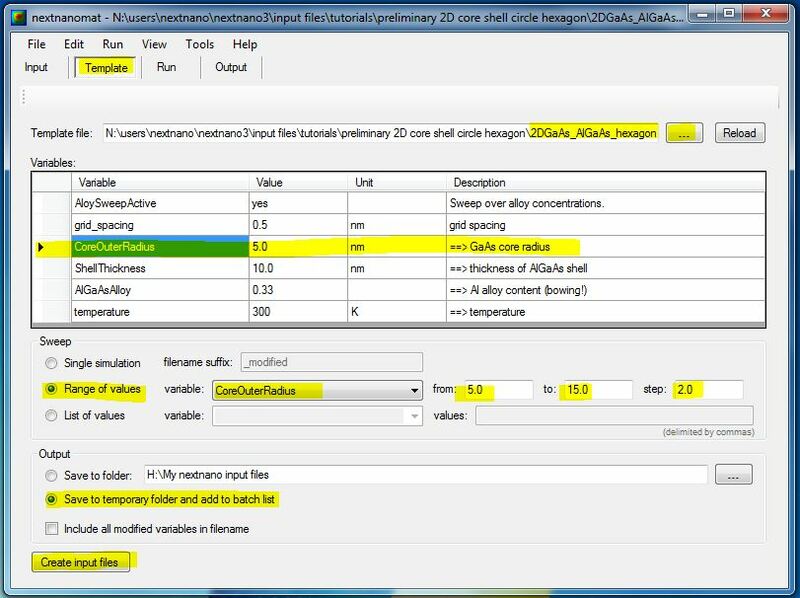 In the following, we vary the alloy content x of the ternary AlxGa1-xAs from 0 to 0.33 in 11 steps. For x = 0, we have pure GaAs. For x = 0.33 we have an AlGaAs/GaAs conduction band offset of 0.285 eV, and a valence band offset of -0.168 eV. In the latter case, the quantum confinement is stronger. Even for x = 0 we have "quantum confinement" due to the Dirichlet boundary conditions (corresponding to infinite barriers) at the shell surface that we use for the Schrödinger equation. 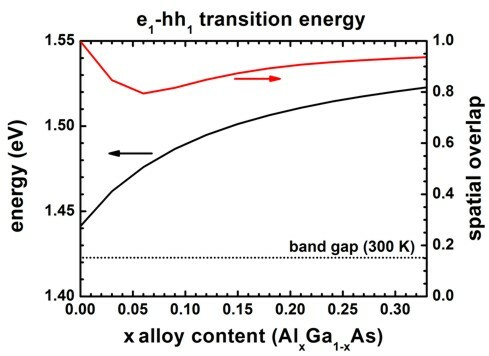 Consequently, even for x = 0, we get an e1-h1 transition energy from the lowest electron state (e1) to the highest heavy hole state (h1) that is larger than the band gap as shown in the following figure. The spatial overlap of electron and hole wave functions is always very high. When there is only confinement due to the shell boundary, the matrix element is very high (99.8 %). The matrix element must be smaller than 1 for x = 0 because the electron and hole masses are different. The matrix element must be even smaller (94 %) for x = 0.33 (strong confinement) because in addition to the mass difference, the conduction and valence band offsets are not equivalent. The matrix element has a minimum at around x = 0.06 because in this case the electron wave function penetrates into the barrier much stronger that the hole wave function does. Thus the differences in well and barrier masses (as well as band offsets) play a high role for the spatial extension of the wave functions. It is also possible to sweep over variables, like e.g. 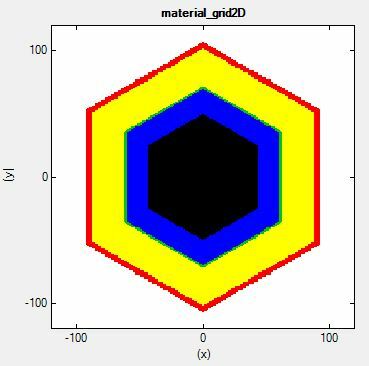 the outer radius of the GaAs core ("CoreOuterRadius") using nextnanomat's "Template" feature. Just select "Range of values", choose the variable to be swept over, and specify a "from" "to" range, and the "step". The click on "Create input files" and switch to the "Run" pane to start your batch list. You can define your own variables using macros. Macros are described here. The following example deals with a delta-doped GaAs/AlGaAs 2DEG (two-dimensional electron gas) structure. In this case, the heterostructure consists of a hexagonal GaAs/AlGaAs nanowire. - white: Schottky barrier contact: The white layer itself is not included in the calculation. It only serves as a boundary condition. Artist's view of a hexagonal nanowire. 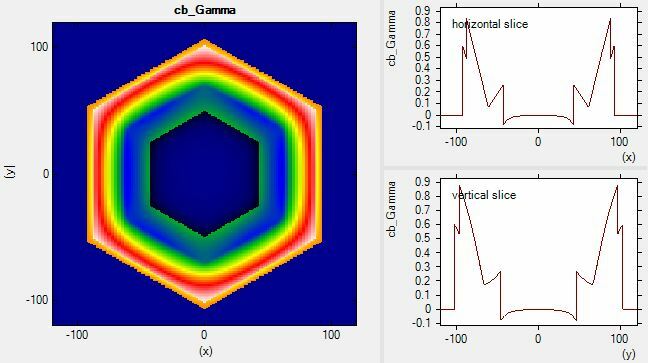 The self-consistently calculated conduction band edge (band_structure/cb2D_Gamma_sub001.fld) is shown next. The horizontal and vertical slices through the center indicate the triangular potential well (conduction band minimum) where the 2DEG is located. The resulting 2DEG electron density (densities/density2Del.fld) is shown in the following figure. At the corners, the electron density is significantly higher, thus one-dimensional conducting channels are formed. 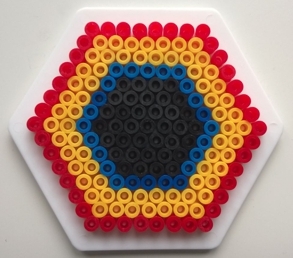 Although the structure itself has a hexagonal symmetry, our rectangular grid breakes this symmetry. Therefore the density in the upper/lower corner are different from the density at the left/right corners. The 2D Poisson equation and the 2D Schrödinger equation have been solved self-consistently. The dimension of the Schroedinger matrix is 28,625. The CPU time for this calculation was about 18 minutes. Please help us to improve our tutorial. Send comments to support [at] nextnano.com.